My first experiences with Freiburg have been amazing and inspiring. The architecture, the history and the atmosphere of the city are all incredible. Although I have only been here for a month, I have already fallen in love with this city. 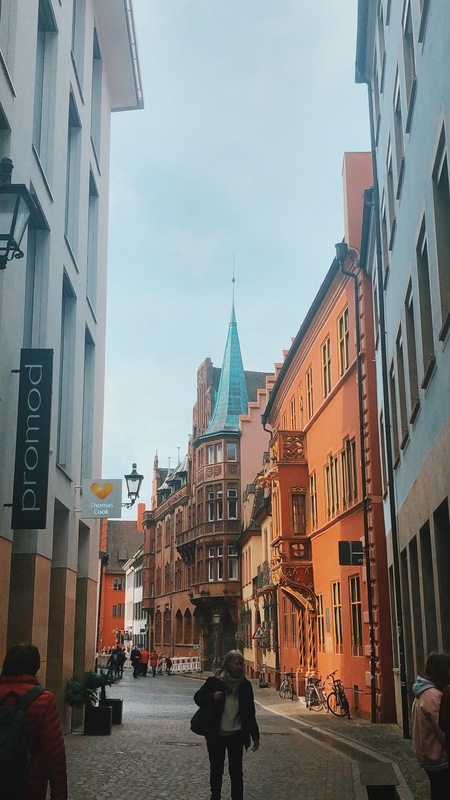 Freiburg is a very big change from my hometown and Georgetown. I have lived all my life in New York City, and obviously attend a university in Washington, DC. Both cities are in general and compared to Freiburg large cities. I was a bit nervous about living in a city so different from my usual for five months, but that was also part of the call: a whole new experience. I still have not gotten used to the fact that stores are never open late/on Sundays or that seemingly everywhere is cash only, I am loving the change of pace that a comparatively smaller city like Freiburg has to offer. 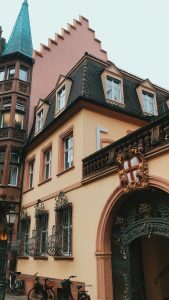 My favorite aspect of Freiburg is the sheer amount of history this city has. 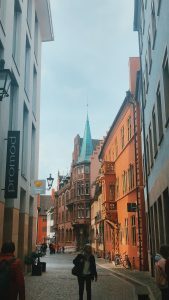 You can feel it in the air, taste it in the food, hear it in the Bächle, the small flowing canals of water on each side of the streets. In general, America has comparatively little sense of history compared to Europe, and New York is much more a city of steel and glass than one of stone and sentiment. As someone who studies history, it is very impressive to be in a place like this. I almost feel like I’m constantly charged with energy and passion for what I love when I’m just strolling through the Altstadt. Academically, my time in Freiburg has been pretty light so far, as some of my classes only began this week, and the rest don’t begin until April 23. This has allowed me a lot of free time to roam and explore and experience the city with the other people in my program. Plus, Freiburg is the sunniest city in Germany so the weather has been warm and nice overall. A short hike up the Schlossberg, a mountain just outside the city gates that once held a fort, allows one to have a spectacular view of the the city and the entire valley it sits in. There’s also a Biergarten halfway up whose patio offers a similarly gorgeous view for those looking for a less strenuous experience. While I can not predict the future, I am sure that I will love my months here and appreciate them for the years to come. And who knows? Maybe someday I’ll come back to Freiburg to live or study or visit. I am very grateful for the opportunity to be here and I can not wait to make the most of it.